Nat will turn 18 months in a few days time. Not only is it a milestone for her growth, it’s a milestone in my parenting journey too. I wrote an article one month back about a cereal experiment I did. While the objective was to teach Nat on self-control, I could also apply counting in the lesson as well. Nat has since improved in her ability to recognize numbers and it’s relationship with counting. 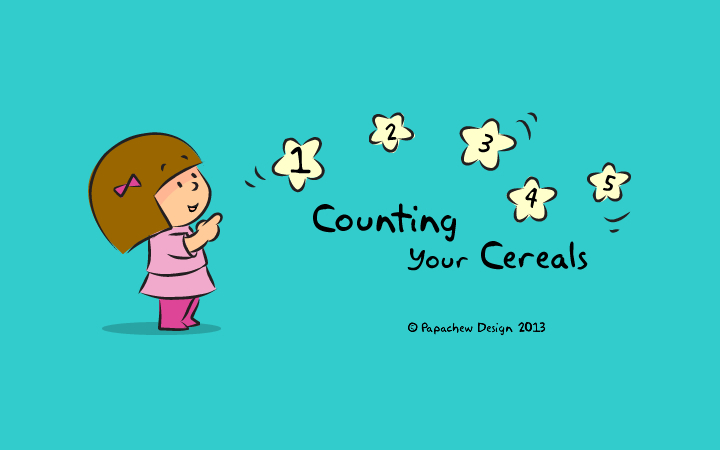 As cereals are still a hit with Nat during breakfast, I continued to take advantage of this to teach her to count. While doing this, I also try to introduce counting in different languages to her. I’ve come to learn that learning should be made fun for our kids in order for them to associate it to something positive and fun. If we are observant enough, we should be able to spot things that will attract and interest our children. And when we make use of those elements in our teaching plans, it should help them create a positive experience in learning. With trying so many methods, I’ve noticed that Nat can learn and remember things better when it is something that she enjoys. What are things that interest your child? Start applying it in their learning journey, they might just surprise you. papachew.com » Nat can cook! Leave a Reply to papachew.com » Nat can cook!